Just incase you didn’t get enough inspiration from yesterday’s bean extravaganza post, I wanted to give you one more recipe to add to your ever growing recipe list: these tacos. I posted on twitter shortly after making these tacos that I firmly believed if I ever started a new blog, I’d label “I love tacos.” These in particular pack a rather lovely spicy and garlicky punch. But with that being said, yes, these tacos are spicy: eat with care! Whisk together sriracha, honey, and vinegar. In a shallow pan, toss butternut squash with sriracha mixture, cover, and let sit for 1-2 hours. Place pan of butternut squash in oven and let roast until tender and lightly browning, 25-35 minutes. Stirring halfway through. In a bowl, toss together black beans, lime juice, and cilantro. Once butternut squash is done, turn off oven. Wrap tortillas in a damp towel and place in the oven and heat until warm and pliable. 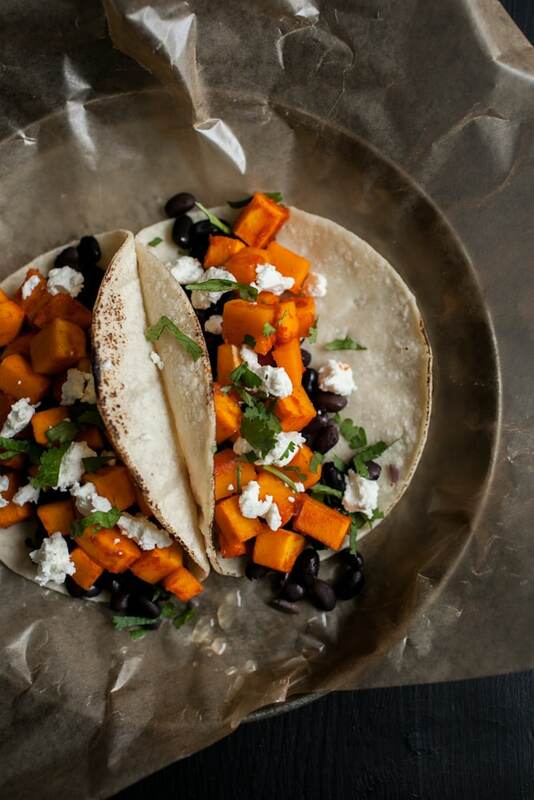 To serve layer black beans, butternut squash, and goat cheese on the warm tortilla. Sprinkle with extra cilantro if desired. *Here’s the thing about sriracha, it’s really easy to make at home. I prefer the homemade version and have had lovely success with this recipe. I could eat these every night! Lovely! I love Sriracha, but I’ve been really into Cholula lately. Either way, great recipe. Erin, these sound fantastic! I’ve been consuming so much Sriracha lately to the point that I don’t find it all that spicy anymore. Love the simple combo with the goat cheese. I am alllll over these! Heck yes! you said sriracha. then you said squash. heaven. I am actually salivating just from looking at this ingredient list! Erin I love your taco pics and recipes! Honestly, they make me appreciate my love for this simply yet perfect food every time. It’s no wonder I could eat them every day! I made these for dinner tonight. Delicious! Great recipe and thank you! Yes! So glad you liked them! You combined two of my favorite things – black bean tacos and sriracha!! saw this recipe on pinterest and can’t wait to try it out! 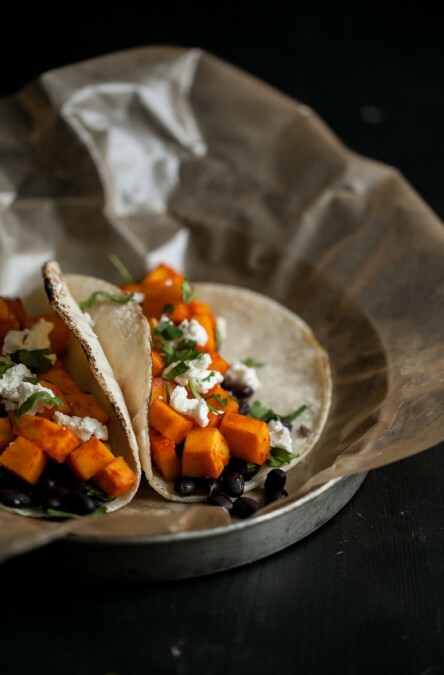 I love butternut squash and black bean tacos! I never considered adding sriracha to the squash though–it sounds so good! This recipe is a keeper! Thank you so much for posting!! I love your blog; I’ve always wanted to cook more, and your recipes are approachable, healthy and absolutely delicious! I feel like I’ve stumbled upon my eating-soul-sister. Yay! Thank you so much and I’m glad you are cooking more! My husband and i decided to go vegetarian for our health and our little boys health. Thank goodness i stumbled across your website! It is going to be so much easier now. I made these last night. I doubled the recipe so that we would have leftovers. Well, we ate it all! So so so delicious! Im making the zucchini paella tonight! Loved this, will be making again! I even liked the vegan version (just because I didn’t have appropriate cheese). One note: I had to bake the squash for a lot longer than in this recipe, more like 50 minutes before it was cooked to my liking. Wow! Had to pause mid-meal to comment because these are so delicious. Thank you! If you used a salsa with this dinner what would you recommend? I found a recipe on Allrecipes.com called “Fresh Apple Salsa” that sounds like it would be perfect – heat from peppers with walnuts and ginger. Holy yum! I made it with delicata squash. Really good flavor. I googled butternut squash and came across a few major sites, click through the recipes and saw tacos. 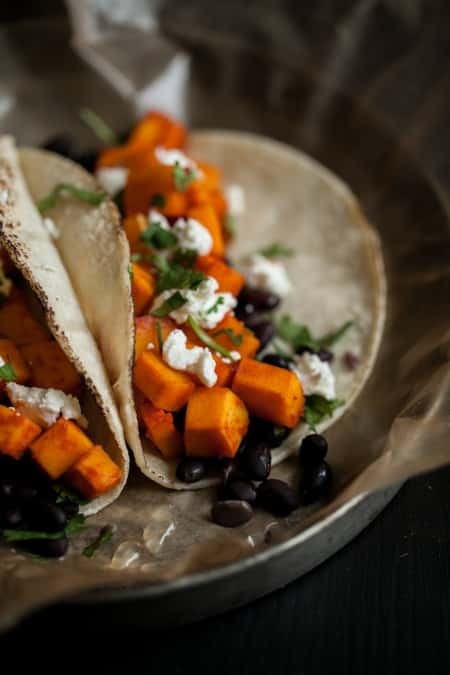 So I googled butternut squash tacos and choose this one because I had all the ingredients already in my kitchen. My boyfriend and I really didn’t expect to much from it when making it. OH… boy was I wrong! These are DELISH! Everything about this recipe is perfect, the sriracha, honey, and vinegar mixture is amazing on the baked squash. The goat cheese, YUM! Everyone needs to give these a try!